Till recently, if you wanted to trade any of these international currency pairs, you’d have to open an account with some obscure broker outside India, probably domiciled in Cyprus or Isle of Man, wire funds to the broker’s bank account, and trade based on the rate he relayed. There was no regulatory framework here, which made the whole affair a bit shady. Now, none of that is required. The National Stock Exchange, under the full regulatory framework, has finally allowed cross currency futures and options to be traded on the exchanges. All the above-mentioned currency futures are available to trade on NSE. In this chapter, I’ll try and give you information on how these contracts are structured so that you can trade them effortlessly. By the way, here is a quick trivia for you – according to BIS survey, about 88% of the International Forex trades happen with USD on one side of which, 50% of the trades are on EUR USD, GBP USD, and USD JPY. So this should give you a sense of how massive these contracts are. Anyway, let us brush through some basis before we proceed. When you see a currency pair – say EUR/USD, the first currency is called the Base Currency and the 2nd is called the Quote Currency, and the currency pair is always quoted in the quote currency. So for example, if you see the price of EUR/USD = 1.23421, then this means 1 EUR is equal to 1.23421 US Dollars. So if you wish to buy the EUR USD, that means you are willing to pay USD 1.2431 for 1 EUR. Likewise, if you want to sell, you are willing to sell 1 EUR to 1.2429 USD. NSE has introduced both futures and options on these international currencies. I think it will be a while for the options will pick up steam, however, I think the near month futures will attract traders on an immediate basis. The lot size convention is important to remember, and you will understand why a little later. The tick/pip that will trade on the exchange is 0.0001 for EURUSD/GBPUSD and 0.01 for USDJPY. There will be 12 monthly contracts available for trading. Near month contracts will expire 2 days prior to the last trading day of the month. The Profit and Loss for cross currency contracts will be shown in the quote currency and not in INR like it is for normal equity, commodities and currencies traded in India. Let’s understand this with an example of all the 3 contracts. The Profit and Loss for the position are converted to the INR using the Reference rate (released by RBI at 12.30 PM) at the end of the trading day. P&L for EURUSD and GBPUSD will be converted using USDINR and USDJPY with JPYINR rate. The options contract follow suit to USDINR options, that are already traded on the exchange. Here are the contract specifications. Contract cycle – There will be 3 monthly and 3 quarterly contracts. There will be three continuous monthly contracts followed by a quarterly contract every 3 months. Strikes available – 12 In the Money, 12 Out of the Money, and 1 Near the money option. So this is roughly 25 strikes available for you to pick and choose from. All near month contracts will expire 2 days prior to the last trading day of the month at 12.30 PM and will be settled at the final settlement price. Let’s look at how the final settlement price is calculated. The cross currency rate for the pair will be calculated using the reference rate of the individual currency quoted in INR. Futures contracts will be marked to market at the final settlement price and cash settled in T+2 days. The intrinsic value of all in-the-money contracts will be calculated at the final settlement price. Let us understand this with an example. All contracts traded will have an initial margin of 2% of the contract value and an extreme loss margin of 1%. Margin blocked will be in Indian Rupee but the currencies will be traded in the quote currency (USD or JPY), the margin blocked will be converted to the quote currency. All trades placed before 02:00 PM will block margins as per the previous trading day’s reference rate and trades placed after 02:00 PM will use the trading day’s reference rate. Daily and Final M2M settlement will be based on the RBI reference rates. Where to get previous EUR/USD chart data on Kite. for TA ? On Kite, chart data for cross- currencies is only available from 27 Feb 2018(launch of cross-currency trading). For TA(if you need chart data older than 27 Feb), I would recommend you use international forex charts that are freely available. One more thing, currently I am checking realtime EUR/USD data on tradingview site. But when I compare the EUR/USD rate on tradingview to Kite, I can see some differences. There are 6 digits in trading view as compare to kite which have 5 digits price. Moreover, there is approx. 6 pips difference between tradingview & Kite price, is it because on tradingview the chart is spot & on Kite the price is future ? These are few arbitrage opportunities and I’m guessing they will go away when liquidity picks up in the Indian Markets. Also, a large part of this can be attributed to the involvement of RBI’s reference rate. Its almost 8 months now….and Zerodha is yet to start the cross currency trading???? Does it take so long to do testing….. No one in Zerodha has got a clue as to when it is going to start. Hopefully, Nithin Kamat may know. I understand. All I can say is that there are few complexities involved which we are trying to sort out. We will put this up only after these things are sorted, else it will be a problem for both you and us. Has zerodha allowed trading in cross currency, because my orders are being rejected. how long will it take zerodha to allow cross currency trading..?? When will enable cross currency trading in our Zerodha? Unfortunately, I cannot give a timeline for this. I’m hopeful this will happen sometime soon. 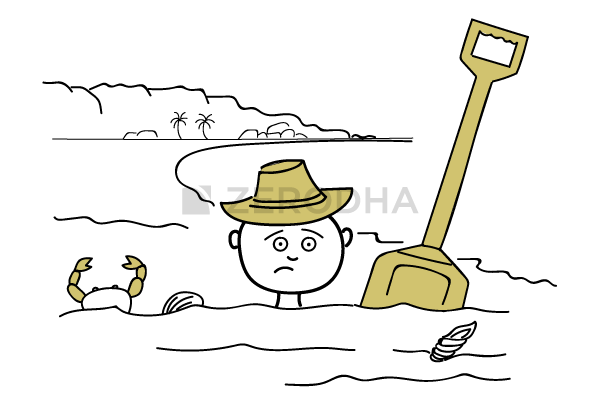 Hopefully Zerodha will allow trading in Gold Option & Cross Currency after their client leaving from him. what books do you recommend for a beginning traders..
please advise only if you have time…or else no hard feelings…. Try and get hold of Alaxender Elder;s ‘Trading for a living’ book. An average trader cannot achieve financial freedom by trading, at the most he will entertain himself by placing few trades here and there. You need to go beyond this. One needs to elevate himself and achieve a higher degree of understanding of markets. This happens by constantly learning and practicing what you’ve learned. Thanks for your valuable advice….. Yes Yes Yes. So true. It needs a vast amount of knowledge and patience. Making profit will just be a matter of time then. Besides, I love this article. Taxation part looks quite outdated now, needs update now. Will look into this. Thanks for pointing. If Base currency is improving then price of pair will go down ? USDINR = x if USD is becoming stronger then ? If INR is improving then ? Similarly for cross currency pair how movement takes place ? Your company only profiting but not customer. Every thing is imagine creature. Price for Pi software, Price for account opening, price for every thing but not profited. Software also worst. I paid brokerage, you should provide everything but . I am not satisfied. Sir, for you to profit or not really depends on how you trade. Sir, can i trade online on spot ,in cross currencies. I don’t want to do a future trading in currency market. No, this is not possible, Jay. When zerodha going to allow trading in these very liquid pairs?? Could you explain why it is not being available for traders? Liquidity is the problem with the whole market, and not broker specific. All my orders related to EURUSD are getting rejected. They are showing error message of ‘RMS:Blocked for EURUSD FUTCUR EQUITY cde_fo Remarks: Blocked for Trading block type: ALL’. What does it mean ? Ashwin, you need to ensure that your account is enabled for Currencies. Can you call support for this? Thanks. I am able to trade other currency pair futures such as USDINR, EURINR , etc . It is showing only on cross currency pairs. Cross currency will take a bit of time, Ashwin. Can I expect that Zerodha will start trading in cross currency pairs within 2-3 months or it is going to take much more time ? I cannot comment on the timeline, Ashwin. But please be assured, we are working on it to make it happen soon. Thanks. Soon, Mithun. Thanks for your cooperation and patience. is only zerodha not allowing customers to trade cross currecny ?? any other broker has strated it or not?? I’m not sure about other brokers, Prashant. We will also have soon, Jay. can u tell us when approximately cross currency trading will be possible? Come on Zerodha, please start trading in cross currency pairs as soon as possible. The volume in EURUSD is good for trading. Any update of cross currency trading availability? Uday, this is on the agenda. Thanks for your co operation. i want to trad in future currency .whatb is the minimum amount to open account?…. My earlier perception was that you guys were really committed towards providing best customer services, something which hardly any Indian company provides. I don’t know how other brokers are doing but that’s not what I see when I deal with you. After trading with Zerodha for almost a year now, the perception has completely reversed. Zerodha is no different from other companies and don’t have a strict adherence to timelines. Copy-paste replies have become so common. Email replies are completely void of any depth, clarification, or smartness. They also seem to be content with their own relative comparison to other brokers in which they are doing the best to provide good service to their clients apparently. 1) Crux – roll-out assurances being given for almost a year now and yet every time you speak to them, they will say that it’s gonna be rolled out soon, probably by end of this week. Never a definitive timeline or any official announcement comes out. Common zerodha, you can do better! Harsh, I understand your concerns. Trust me we are working towards delivery of everything promised. It’s just that the scale we are in, things get highly complex and things take time. I’m hoping you will continue your support and many thanks for your patience. Exchange launched on Feb 27, Zerodha has enough time to launch cross currency pairs. There are few vendor dependencies here, Varun. Hopefully soon is all I can say. Thanks for understanding. Default qty which pops up in the order window is 1, is it the lot size of 1000? or do I need to input 1000 in the qty field ? So total of 3% (2+1) of Margin of the contract value will be blocked in USD value and converted to INR as per RBI 12.pm daily rate? So more or less this is how the base of margin calculation would be? If you could have given an example with screenshot in your tutorial would have helped. For CDS contracts, 1 quantity by default means 1000 quantity(1 lot). So you don’t need to multiply by 1000. Sir,is it worth trading in usd/inr pair?? Yes, why not. As long as you know how to set up the trades. Good luck. u should start as early as cross currency future. all broker provide this service even small ticket broker also prois vide. zerodha is now in top 10 but still in zerodha we unable to trade in cross currency. We are working on it, Nilesh. Hopefully soon. No, its the difference the price at which you buy and sell multiplied by the number of shares (or lot size). When Cross Currency Trading will be available? We have been hearing it from April 2018 that it will be available in Zerodha soon. Is there any specific date or time period? Kamlesh, the intention is to offer it as soon as possible to clients. I hope you trust us that we are doing our best in this regard. Thanks. Can you suggest me some good of shore brokers for cross currency trading please?? Unfortunately, I’m not aware of any, Raj. from where i can check RBI reference rate..and same is updated on site…. Check on the RBI’s website, its available on their homepage. It gets a little tricky with Cross Currency Raj, you will have to take the change in EUR USD plus the change in the reference rate of USD INR. Sorry to hear this, Jay. I’m checking on this. But yes, we are not yet live on cross currency, hopefully soon. Likewise clients unable to trade on Zerodha platform for cross currency pairs are migrating to another discounted brokerage firm offering to trade on cross currency pairs , Clients cannot keep waiting missing on trading opportunites due to Zerodha’s delayed launch . I understand, Jay. As far I know there is no other broker offering this yet, mainly with the issue related to P&L. We are talking to exchange to get this cleared. Thanks. you have false information. i know many brokers who are providing trading in cross currency pairs. I’m sure, Atul. I’m not disputing this. Apologies for the inconvenience caused, can you please provide us your client id. Thanks Jay. Like I’ve said earlier, we are working on this, hopefully, we should be able to offer this to clients really soon. You can trade forex (on NSE) with Zerodha. Maybe you are searching for it the wrong way. Can you please call the support desk? still cross currency not added in kite. HDFC SEC and other brokers have already started cross currency a long time back….. 8 months waiting for Zerodha to start is not acceptable…..no matter what the reason is for the delay. If you guys arein the top 3 brokers in the country…..pls live up to the expectations ? All I can say is that we are working on it, Gerard. Karthik, would have appreciated if you would have replied with a timeline. But, I guess its not in your control to give me an answer. Glad you understand, Gerard. Thanks. We are dependent on exchanges for few answers, so it’s beyond anybody’s help. Karthik, this one is out of topic. How do get volume profile incorporated on the PI platform. Kite has it……but trading on PI is a better experience overall. Can you help pls? Even small brokers like 5paisa has cross currency trading. Feels strange zerodha is still working on it. How would the brokerage on cross currency pairs, be charged? Suppose on next day market open gap down at 59.50 in that case will my order will get executed at 59.50 (for sure ) or it will get executed at lower than that . Yes, since this is SL-M, the order will get executed at 59.5. I m using my Demo account on XM Broker . but i don’t want to open real account in it. can i open real account in zerodha and trade in eurusd. We dont offer cross currencies yet. Are cross currency pair like eurusd valid to trade in our country. It is available on NSE and you can trade. However, we don’t have this yet on Zerodha. Only if you have time! Thanks, Kalpesh! I’m really glad you liked the content. Frankly, I’ve never traded these products so I’m not sure how it works, hence I don’t think I can write about it. Btw, as far as I know, these are institutional products available to banks and other establishments. When will Zerodha Introduce CROSS CURRENCY PAIRS (eurusd, gbpusd…. ) ? Enough is enough we r waiting long How long we wait for cross currency . 2019 now started. Can we trade in cross currency on Kite now? Sheik, thanks for the inputs. I’ll certainly pass the feedback to our team. Sir, I am unable to open eur usd chart in kite Android app. Please help. It is not available yet, Sarup. Any news regarding cross currency trading? Not able to even add cross currency to view rates in kite why??? It is not yet available with us. Why does this post even exist if no one can trade cross currency pairs in Zerodha as of yet? Any timeline for the same? Rishi, we put this up for educational purpose, but unfortunately, I cannot commit a timeline on this. why eurusd gbpusd is not avalible to trade in zerodha ? We have not taken this live for various reasons, Nishant. Hopefully sometime this year. Thanks. When Currency Spread Contracts are available for trading? I understand, but unfortunately, it is taking way too long.